Attention club cats! 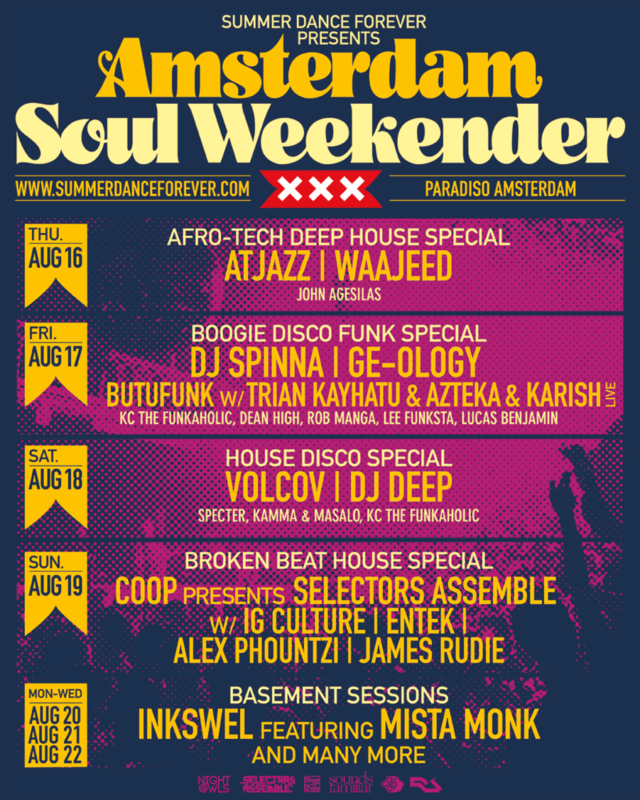 From Thursday 16 until Sunday 19 August we present the very first edition of the Amsterdam Soul Weekender in Paradiso – four club nights jam‑packed with soulful club music. We are excited to welcome some of our very favorite dj’s and selectors. Amsterdam Soul Weekender spans a wide range of soulful dance music genres – most of which have roots in black culture, e.g. afro, boogie funk, broken beat, disco, hip‑hop and house – all presented by leading, ground-breaking artists. As pioneers in their respective sub-genres, they excel in showcasing their distinct sound against the backdrop of electronic music from which they emerged. ➤ Weekender passes and individual tickets are available at summerdanceforever.com/tickets. The weekender is part of the Summer Dance Forever festival, free entrance is included in our festival packages. ➤ Attend Amsterdam Soul Weekender 2018 on Facebook.